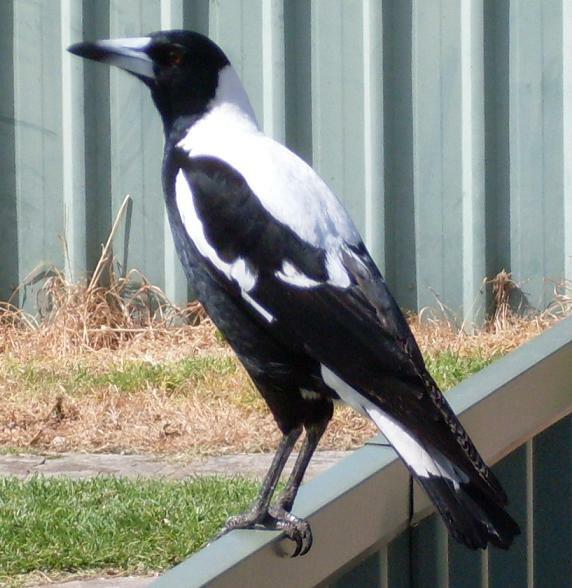 As with a number of other birds in Australia, it’s currently mating season for Australian magpies (Cracticus tibicen). I’ve been swooped a number of times already (even double teamed by a pair – a new experience), which is normal behaviour when they have eggs or young in the nest. I’m going to put it out there, that this is a male; the deliniation between the stark white back and the black feathers being well-defined, without a dirty white or grey feather in sight. Trying to work out the subspecies is the difficult part. Distribution of C. tibicen telonocua, to the west, isn’t supposed to reach Adelaide. Although our little friend here looks a lot like one, and there are intermediaries in the area (growing up as a child, I lived where C. tibicen telonocua is distributed – they’re what seems ‘normal’ to me) . Conversely, the white back doesn’t descend far enough for it to be C. tibicen tyrannica, a subspecies distributed to the east – starting south-east of Adelaide in the Coorong, and spreading further east through southern Victoria before eventually reaching the southern end of the east coast. Maybe Melbournites will notice that the white feathers on the back seem to finish a little high. At a guess, I’m going to go with an intermediary somewhere between the two, m0re telonocua than tyrannica. Of course, if you were wanting something definite, then I’m afraid you’d have to go elsewhere. (I don’t know anything about the population genetics of the Australian magpie, and my understanding of the taxonomy going on between currently recognised subspecies borders on the non-existent). An enjoyable little encounter all the same. He didn’t seem to mind my walking up within a foot of him, and the little fella strikes a nice pose. Posted on September 15, 2011 by Bruce EverettPosted in Naturalism, Nature, PhotographyTagged Cracticus tibicen. Previous Previous post: 2012 Global Atheist Convention – I’m going, are you?